In a searing op-ed in USA Today, President Obama's top counterterrorism adviser responded to critics of the administration's policies and defended its handling of the failed Christmas day bomber. Echoing comments he also made on "Meet The Press" this past Sunday, John Brennan, the assistant to the president and deputy national security adviser for homeland security, said that most critics to the president were "misrepresenting the facts to score political points, instead of coming together to keep us safe." "Politically motivated criticism and unfounded fear-mongering only serve the goals of al-Qaeda. 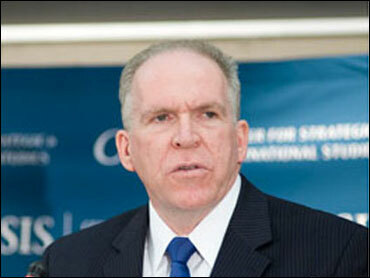 Terrorists are not 100-feet tall," Brennan said. Brennan said that Umar Farouk Abdulmutallab was "thoroughly interrogated and provided important information," and that senior officials from the White House, the intelligence community and the military also supported the decision to charge him in criminal court. Brennan also defended the decision to read Abdulmutallab his Miranda rights, something that Republicans have harshly criticized. Brennan said the decision to do so was "a long-standing FBI policy that was reaffirmed under Michael Mukasey, President Bush's attorney general." He added that the most important information was actually obtained from Abdulmutallab after he was read the rights. "The critics who want the FBI to ignore this long-established practice also ignore the lessons we have learned in waging this war: Terrorists such as Jose Padilla and Saleh al-Mari did not cooperate when transferred to military custody, which can harden one's determination to resist cooperation." Brennan said it was "naïve" to think Abdulmutallab would have been more prone to dispel valuable information if he was transferred to military custody. "There is little difference between military and civilian custody, other than an interrogator with a uniform. The suspect gets access to a lawyer, and interrogation rules are nearly identical," he said. "The notion that America's counterterrorism professionals and America's system of justice are unable to handle these murderous miscreants is absurd," Brennan added. Brennan also charged that critics were being hypocritical, saying that "would-be shoe bomber Richard Reid was read his Miranda rights five minutes after being taken off a plane he tried to blow up. The same people who criticize the president today were silent back then." Brennan also sought to highlight successful actions taken by the administration, saying their efforts have "disrupted dozens of terrorist plots," and that they have been responsible for "killing and capturing hundreds of hard-core terrorists." "We need no lectures about the fact that this nation is at war," he added.